New Zealand fashion label Maaike has partnered with Pamoja to develop a limited edition clothing print for our Pamoja community engagement staff – and one of these prints could be yours! Maaike is a New Zealand owned and operated clothing label run by Abby van Schreven and Emilie Pullar, since 2010. Maaike specialises predominantly in womenswear, with all their clothing being designed and made locally. In 2017 they launched their children’s line – Mini Maaike. Abby and Emilie are huge supporters of the New Zealand AIDS Foundation and pounced on the opportunity to partner with Pamoja. “We had so much fun designing this print; getting to design clothing for the Pamoja team has been a great experience. Pamoja’s goal of ending new transmissions of HIV in New Zealand has our full support. We are so glad to have the opportunity to come on board and can’t wait to see Pamoja develop over the coming months.” – Abby. The Maaike x Pamoja print celebrates the colourful spirit of African communities in Aotearoa New Zealand. It was developed in close collaboration between Maaike’s graphic designers and the Pamoja team. 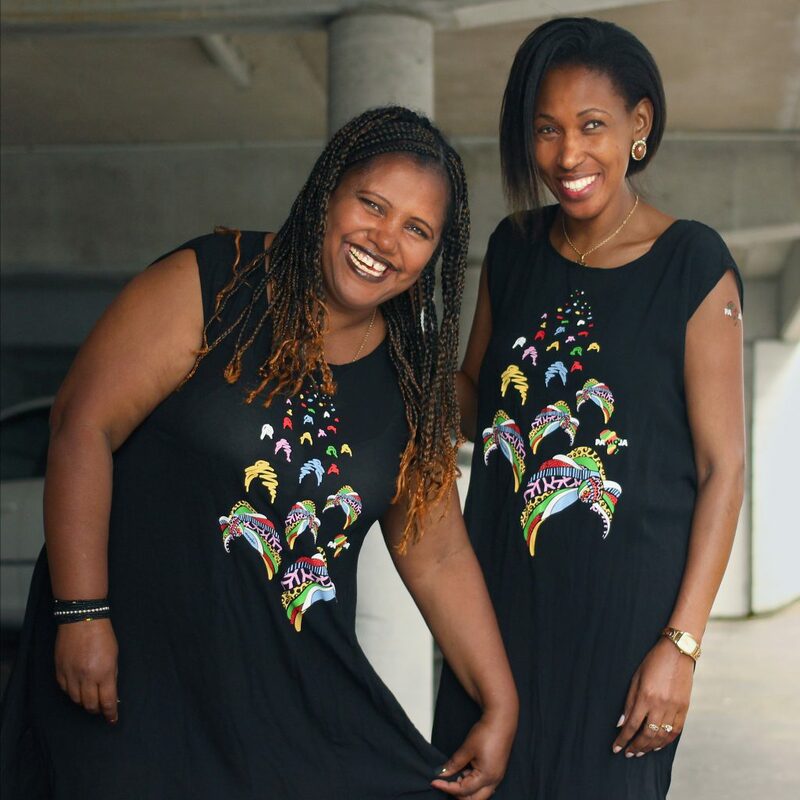 This includes Yehuala and Judith, as pictured in their printed “Music” dresses. We have one additional printed tee to give away. 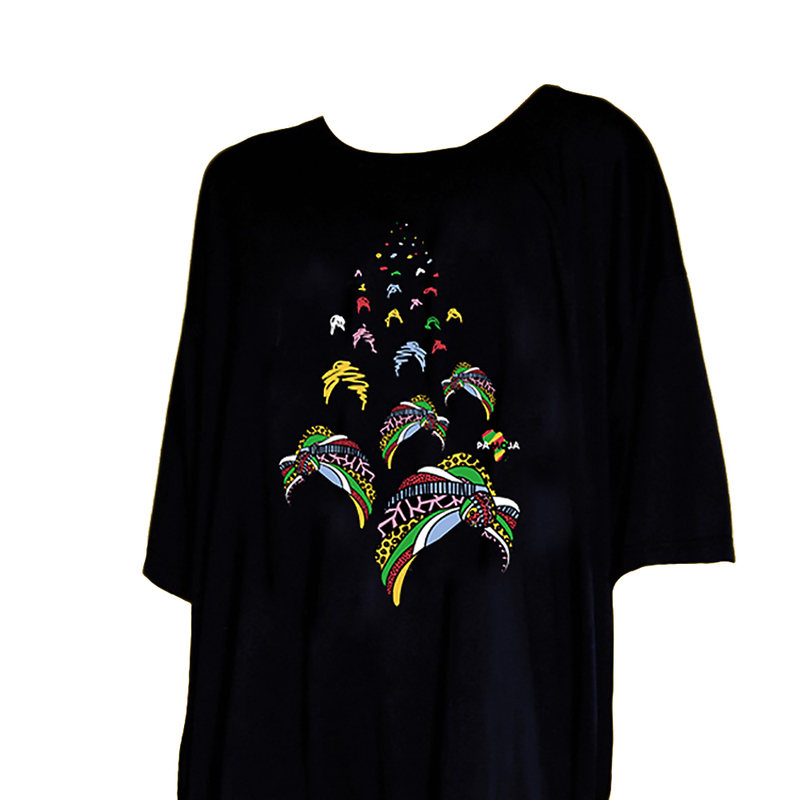 The t-shirt is unisex, in a relaxed, oversized fit (one size fits all). To enter the draw, simply follow us on Instagram at @hellopamoja, and tag a friend in our post, pictured below.